The first Jewish Long Day Care Centre and preschool in Canberra has opened its doors. There are more than 1200 Jewish residents in Canberra and many more in the surrounding region. 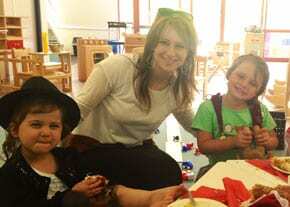 When asked why Chabad has placed such a strong emphasis on, and investment in, opening a Jewish preschool, Rebbetzin Chasia Feldman, Co-Director of Chabad ACT and Jewish studies coordinator responded “It is a natural and instrumental step in establishing a vibrant and sustainable Jewish community. Our future begins with the education we give to our children from a very young age. Our preschool was designed and created to offer the very best of physical standards. Together with our dedicated staff we also aim to be committed in providing the highest level of education including general development, academics and Jewish enrichment, to giving emotional and spiritual care for the children who attend”. The encouragement and drive behind building the preschool was the dream of some local Jewish families to be able to educate their children here in the spirit of their religion and tradition. This was made into a reality as a result of the efforts and inspiration of Rabbi Arel Serebryanski of Melbourne. The Long Day Care Centre and Preschool will meet all the necessary government outcomes and also provide an integrated Torah curriculum – the combined curriculum will comply with the national quality standards of the ‘early years learning framework’. The award winning, state of the art Gan Yisroel Childcare and Community Centre is situated in leafy Northern Canberra and has capacity for 55 children. Although the facility has currently only eight enrolments, more children are expected to sign up to begin studying at the preschool in the near future.